I love quinoa. But I’m really not a fan of it by itself. Are you? My preference is to enjoy it when it’s “mixed” into something like a pesto quinoa salad or as a pilaf with garlic mushrooms. Mmmmm. I’ve been making this version of a Thai quinoa salad for years now but never really took the time to standardize the recipe. With some encouragement from friends and family, I finally did it. I want it to be hearty enough to be a meal, so I need a solid source of protein. Enter the edamame bean! A ½ cup serving of edamame beans is about 12 grams of protein. I want color. I eat with my eyes so against the quinoa I wanted to see some yellow, red, purple and green. A colorful meal also means I’m feeding my body variety of nutrients. I want a good-for-you dressing. I’m not fearful of fat and my mantra has always been: it’s not the quantity of fat you eat, it’s the quality. The dressing for this recipe is largely based on peanut butter. Go for a natural PB that isn’t loaded with added fats, sugar or salt. The dressing also has lovely hints of ginger which is great for digestion and amping up the flavor of this salad. I want it to still be good the next day. C’mon, we all know many salads don’t hold up more than 24 hours. Not this recipe! I prefer to keep the dressing on the side and pour on more as I need it. 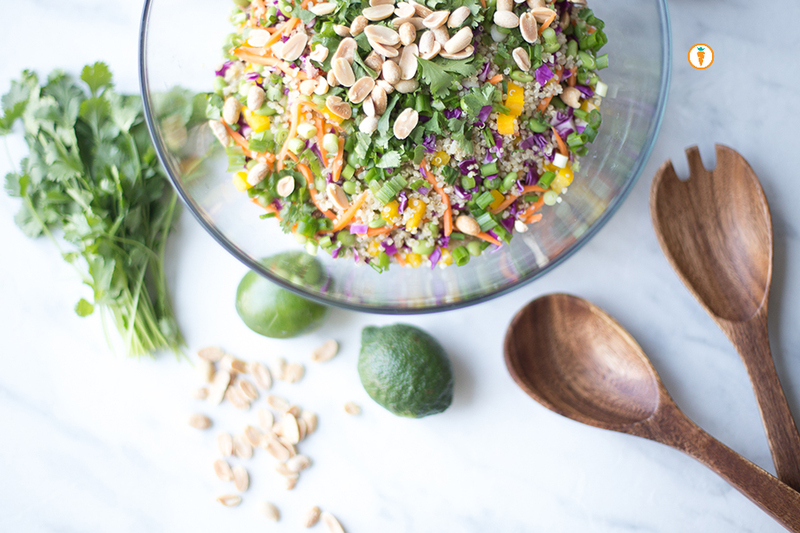 The quinoa salad itself stays perfectly fine for 3 – 4 days when kept refrigerated in an air-tight container. This recipe is a hit, no matter where I go. My vegan and vegetarian friends and mama's all LOVE it. It's perfect for weekday lunches, as a side or for sharing at a potluck. Prepare quinoa: ensure you've thoroughly rinsed and strained it. Place quinoa in a small pot with 2 cups of water. Bring to a boil and reduce heat to low, cover and simmer until tender and the liquid has been absorbed. About 15 - 20 minutes. Fluff with a fork. Set aside and cool. To the quinoa add in cabbage, bell pepper, carrots and edamame beans. Fold this into the the quinoa. Prepare the dressing by mixing together all eight ingredients. I often use a handheld blender to do this job but you could totally use your muscles and a strong fork. Garnish with cashews, cilantro and green onion. Serve chilled (or eat it up right away). Food photography done by the talented Ceone Dyck. To learn more about Ceone click hereor follow her on Facebook. Don't forget to follow Carrots and Cake on Instagram to see tiny square snap shots of my life. I am a Registered Dietitian, a mom and wife, an absolute foodie and founder/owner of Carrots and Cake Balanced Nutrition Consulting. Healthy eating doesn't have to be boring! We love sharing our favourite recipes almost as much as we love cooking them. Enjoy! We’d love to have you join our community so you never miss a post. Don’t worry, we promise to only send you an email twice a month.